Things to do in June Lake! Famous for trophy trout, refreshing Alpine lakes, excellent skiing, challenging outdoor activities and incredible scenery, June Lake, California is a small town vacation resort, a four season destination on the eastern slopes of the Sierra Nevada Mountains between Yosemite and Mammoth Lakes. You too will fall in love with June Lake and make it your vacation destination for years to come. 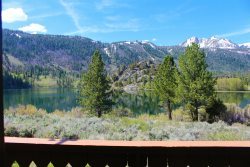 As an original owner of a condominium in the June Lake Interlaken complex, I would like to share a brief history and description of Interlaken. In 1976, I heard that the Interlaken condominiums were going to be built on the shores of scenic Gull Lake in the June Lake Loop. This would be the first condominium complex to be built in the loop though neighboring Mammoth Lakes had numerous condos. Having spent most of my childhood vacation trips hiking, skiing and fishing in the June Lake area, this immediately caught my interest. Bud Hayward, the developer and owner of June Mountain, had purchased 5 acres of land directly on Gull Lake and within minutes of June Mountain. His vision was to create a model condominium complex that would stand out above all others. Typically, most condo complexes on 5 acres of land contain 100 units but Interlaken would only have 38 large, spacious, lake-side units amid aspen trees. Each unit was designed to have a view of spectacular, deep-blue Gull Lake situated below the massive granite of Carson Peak. The complex would have 2 tennis courts, 3 spas and half-court basketball. Luxury and comfort were to be the keystones of Interlaken with great attention spent on construction detail. But before construction could begin, back-to-back gasoline shortages and volcanic earthquake swarms (which, for the most part have now ceased) caused the lending banks to stop the construction loans, citing the reason that because of the cost and shortage of gasoline, travelers would not make the drive to June Lake for their vacations. It took another 6 years before construction began and Interlaken was finally completed in the fall of 1982. Because the June Lake Loop is also known as “Little Switzerland,” Interlaken is modeled on chalets built in the Swiss Alps, which also ties in with the chalet construction on June Mountain. Wilbur Tullock, who was integral to the construction of the June Mountain chalet, used his expertise to hand cut each of the vertical stairway panels and balcony railings in a design that is unique to each of the seven buildings in Interlaken. While construction was being completed on the condominiums, Bunkie Hayward, Bud’s wife, gathered the new owners together with a Southern California interior designer to pick out wall coverings and furnishings. Most owners decided to follow the Swiss theme in their selections though presently, almost all of the units have been refurbished to keep in line with technology and interior design improvements. One of the qualities of Interlaken is its peaceful ambiance. The units are well-insulated which provides the residents with the feeling that they are the only ones living there. About the only excitement that the complex ever encountered occurred many years ago when some local residents decided to relax in one of the spas. The sheriff was making his customary night-time check of the premises when he encountered the locals enjoying the spa. The locals jumped out of the spa and ran in multiple directions, jumping into their vehicles to exit the complex as quickly as possible. Because the units are so well-insulated from noise, a resident, not knowing what was going on, exited her unit to take her golden retriever, Sophie, for an evening walk. In the confusion, Sophie jumped into one of the fleeing vehicles and now the incident had become a dognapping. Fortunately, Sophie was eventually found unharmed some hours later on the outskirts of June Lake. Because Interlaken is located directly on Gull Lake and adjacent to an unspoiled meadow, the residents are treated daily to views of the natural wildlife while safely sitting in their living rooms or on their private balconies. Mule deer can be seen in the early morning, late afternoon and evening as they graze and play in the meadow or around the tennis courts. Coyotes, bears and an occasional bobcat have been spotted by the Interlaken residents. Osprey, hawks, eagles (including the bald eagle) soar over the lake and meadow throughout the day. Sometimes, depending on migration patterns, a tundra swan might be observed swimming on Gull Lake. At night, the clear, smog-free sky offers an unparalleled view of the Milky Way. Trout fishing, hiking, skiing, snowboarding, snowmobiling, kayaking and horseback riding are all within minutes of Interlaken. For those who like to split their skiing and snowboarding time between multiple locations, June Mountain is directly across Gull Lake from Interlaken and Mammoth Mountain is within a short, 20-minute drive. The June Lake loop is famous for its spectacular fall colors and is often featured in Sunset magazine as one of the best places for photography. Because June Lake is located on the east boundary of Yosemite, the east gate entry to upper Yosemite and Tuolumne Meadows is within a 30-minute drive of Interlaken. Interlaken is a favorite place for celebrities and families to stay. The spacious units and beautiful scenery add the special touch that makes vacations, family gatherings and weddings memorable. © 2019 | June Lake Accommodations - All rights reserved.